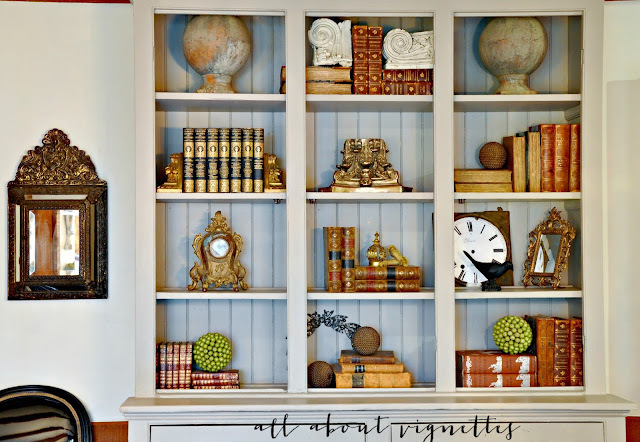 I've styled many bookshelves in the past and it's one of my favorite things to do. 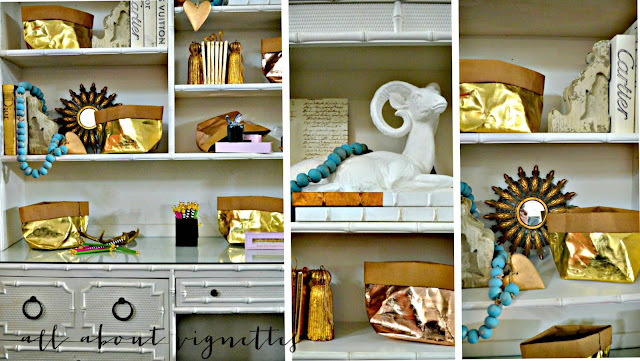 When I found this vintage faux bamboo desk, chair and shelf, I knew it it had to have a fun and modern vibe. I want to share some of the guidelines I follow. 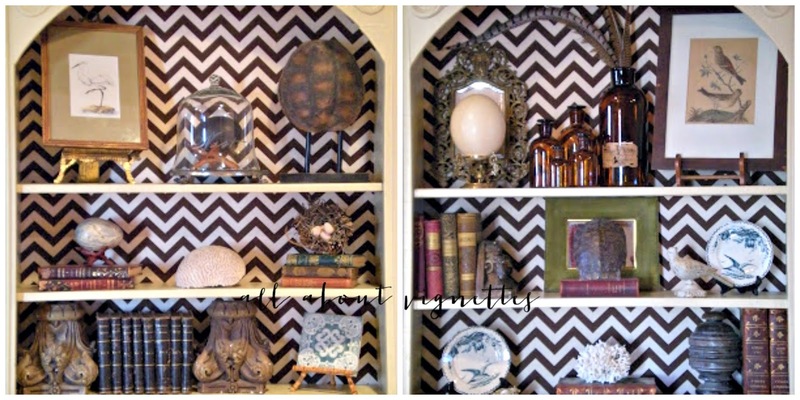 Below is a collage of the shelves. Assemble like items. You can see that I'm using "desk" related items. I have some pens sprinkled around and in containers, books of course, and bookends. If you look on the right you'll see a ribboned bag with oversized paperclips too. Add interest with unique objects. 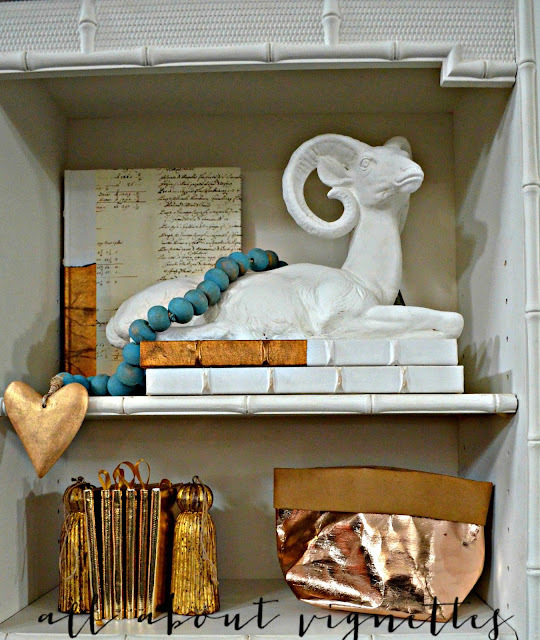 I used some wooden tassels as bookends, added a vintage ram sculpture, and some books with interesting covers. Remember: Books can be vertical, facing out, or stacked horizontally. Repetition is another important element. For these shelves, besides repeating desk items, you'll see the color gold, or metallics throughout. 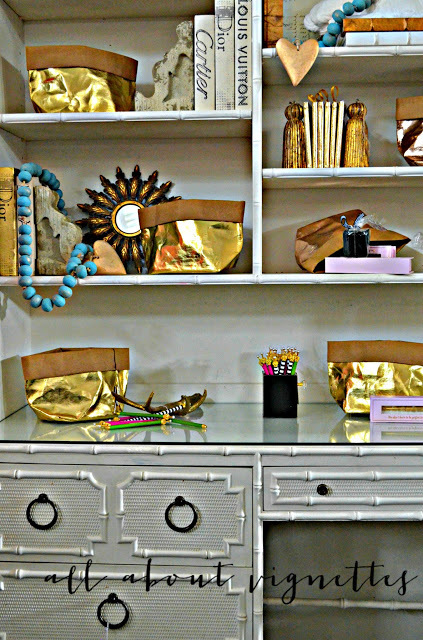 There are metallic sacks/baskets on almost every shelf, and a grouping of gold journals. 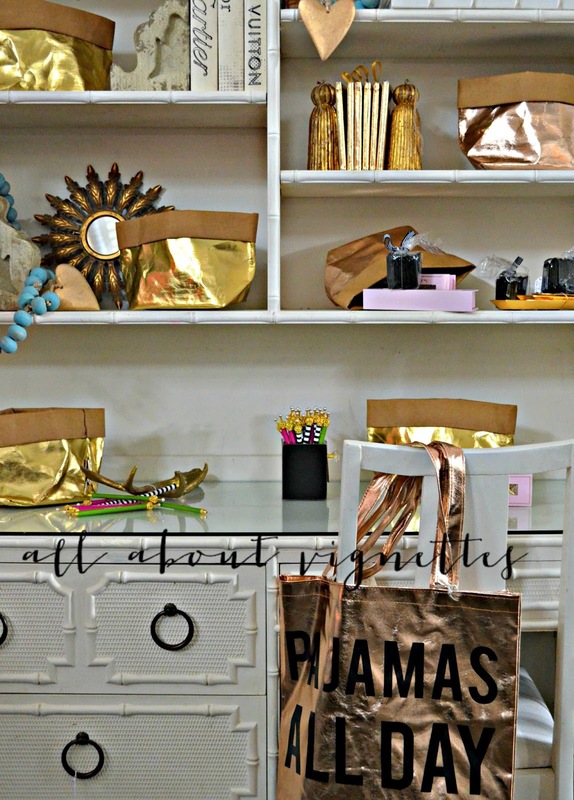 I even draped a metallic tote over the chair. I always like to introduce a second color. The blue beaded garland breaks up all the gold. The gold heart ties it into the rest of the shelves. Balance is important too. I broke up the books and bookends and placed them on different shelves. This repetition creates cohesiveness and keeps your eye moving around. 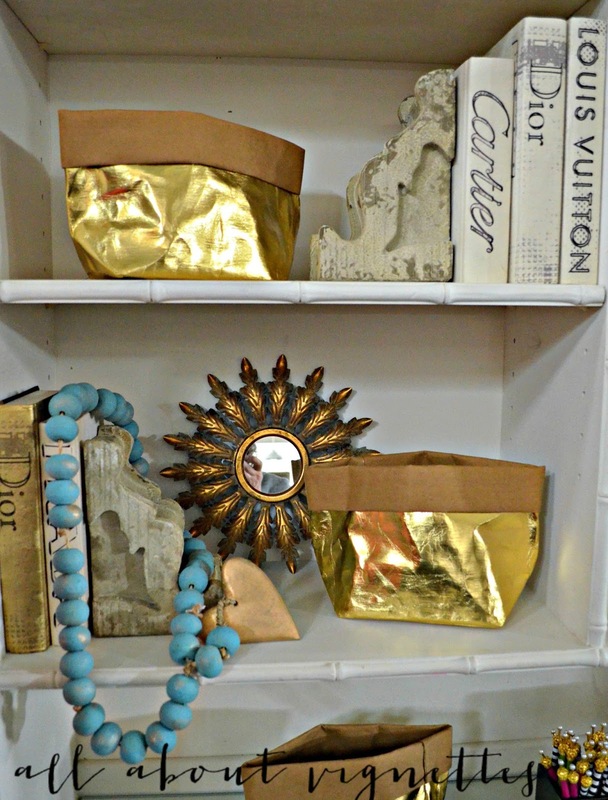 The plaster bookends add texture too. I always add a mirror to a shelf. This small sunburst mirror adds the color gold, more sparkle, and reflection too. REPETITION IN MIND AS YOU STYLE YOUR SHELVES. If you'd like to see how I styled another bookshelf in an entirely different look, go here for that post or click on the image below. Or, go here or click on the image for my nature-inspired shelves in my family room to see that post.